What is the single most important item on a resume? What do recruiters look for in a resume at first glance? The answer to both questions is the same: work experience. I cannot emphasize enough the importance of proper execution of this part of your resume. It’s make it or break it for your job application. This section of your resume can decide singlehandedly the moving direction of it i.e. is your resume going to a “shortlisted” pile or to a “rejected” trashcan. Having that in mind, presenting your work experience in a proper manner is a skill you’ll have to master if you want your resume to shine. So, without any further delay, let’s get to specifics of this segment of your presentation to the employer. Companies you worked for – Regarding the names of the companies you worked for, you don’t have to write the full, official business names of the companies only if it’s a widely known brand. If you state that you worked for BMW, all hiring people from the automotive industry will know that it is Bayerische Motoren Werke AG. On the other hand, if one of your previous employers was John’s Bar, be sure to write down the full name of the company. If the business of the company you worked for isn’t obvious, state it very, very briefly in just a couple of words (for example: Bull’s Horn, a local bar). Locations of your previous employers – Localization of your previous employments is very important for hiring people so write down the city and state (area) of the company you worked for. Don’t go further into details (i.e. address, zip code etc) since you’ll be spending valuable resume real estate on data that can be found easily if there’s a need for that. Employment dates – If your work experience timeline doesn’t have some big gaps, you should go with the standard month/year format of the dates of employment. Write down full month name and year (e.g. November 2012) since that kind of formatting is the most readable. On the other hand, if you had longer periods of unemployment and would like to mask it a little, in some specific cases you can name only years of employment. Gap in work history is a topic that deserves a separate article and I’ll try to deliver it as soon as possible. Your titles/positions – Recently one job applicant asked me for advice on changing the title that he held at previous company. He wanted to make it look a little bit fancier. Beware of this. Never change the names of positions you held since your soon-to-be employer can call the previous one and inquire about you. Imagine that you presented yourself in a resume as a Key Account Manager; recruiter calls your previous boss only to find out that you were just a regular Customer Relationship Officer. Immediate rejection, that’s what it’s called. Remember my advice on the obviousness of your previous employer’s business ? Same applies to the clarity of your job title. If the recruiter can’t find out immediately what your job was from your job title, add a tag that describes it in a couple of words (for example, if you write ATCS for your position, you should add Air Traffic Control Specialist next to it). Be sure to include all relevant working experience, whether it was full-time, part-time, an internship, a temporary job, project or self employment. Promotions – Be sure to note that you’ve been promoted if that was the case. That shows to your future employer that you did a good job in your previous company. Otherwise you wouldn’t have been promoted. Awards, recognitions – You can have a separate section of your resume with awards, but it’s better to include it in the work experience section because it can show clear connection of your previous outstanding results to requests of the new position. Something about the job you’ve been doing – Note that I haven’t named responsibilities or duties in this bullet. There’s a very good reason for that as you will see. This is the most important part of your work experience section. It’s of such significance that it deserves a separate chapter i.e. the next one: Achievements vs. Responsibilities. Most recruiters are going to tell you, if they have to select a single, most annoying mistake candidates make in their resumes it would be the description of work experience. I saw that myself hundreds of times in various resumes. The point is, when you have to describe your experience in the particular company, never write a lengthy job description for that position. Numerous phrases that begin with “responsible for…” and “main duties…” are a sure way to rejection of your job application. Let’s think about it for a second. If you’re a recruiter and receive a resume which perfectly describes responsibilities of the given workplace and nothing else, how are you going to know how the applicant performed those duties during his employment? Recruiters are usually specialized in some industry, HR staff even more, so description of responsibilities of the position in question is almost excess. Just because of different nomenclature amongst different companies you should write a very brief job description (no more than 2 lines of text in a single-bulleted paragraph). Anything more on that topic is almost irritating for recruiters. So, what’s missing? What to write? Again, it’s very simple. You have to describe what you achieved at the given position during your mandate. If there are dozens of candidates with similar or same job descriptions, in order to differentiate yourself you need to show your uniqueness. Respectively, naming accomplishments you achieved during your employment is an absolute must on your resume and work experience section. Achievements should include increases of good numbers, decreases of bad ones, major projects, fulfillment of targets several tens or hundreds of percents over 100%, all kinds of improvements you brought to the company etc. Of course, the former is much more expressive in showing the decrease of costs. It’s the same for recruiters. Always try to back up your achievements with relevant figures so the recruiter could quickly grasp what potential benefits you can bring to the company. “Increased monthly sales by 10K EUR in 2 months”. Second statement is making it easier for a recruiter to find a place for your achievement in his value assessment system. Always be time specific when you name your achievements. Matched with job description – If you want to order a chocolate cake in the restaurant you don’t look at the menu under “grilled meat” but under “chocolate cakes”. The same is with achievements and job ads. If the company is looking for an experienced driver, you’re not going to write “corporate Facebook page I maintained went from 0 to 200 000 likes in 6 months” but “drove 400 000 Kms in 2 years”. Treat job ads as a questionnaire you need to fill out. In your work experience section you’re supposed to illustrate how you will respond to requests the employer stated in the job ad. Honest – This one is a no-brainer, isn’t it? Well, you would be surprised how many people lie in their resumes. It’s easy to get carried away and instead of “increased sales by 30k USD” write “increased sales by 45k USD”. Who’s going to check that anyway? Well, it’s not like that. I do agree that not all data is verifiable, but believe me, you don’t want to risk it. Imagine that you managed to land an interview for a dream job, even passed it and then you fail on background and references check because of some exaggeration or something similar. It’s just not worth it. Always be completely honest. Have in mind that this doesn’t mean that you can’t express yourself in a way which highlights good items in your resume and diminishes bad ones. Just don’t get carried away. Have in mind that if you have a Summary or Highlights section on your resume, it would be a big mistake to repeat yourself and duplicate data in both sections. Nobody wants to read the same thing twice, especially on a resume, which is supposed to present as many of your qualities as it can in a very short time. Make sure that responsibilities and achievements in your work experience section work together in a complementary way. Having that in mind, one of the proven methods is to write your responsibilities in a very short paragraph (no more than 2 lines of text) and to follow that with achievements written in bullets. Read more about this in the next chapter about formatting your work experience resume section. We all know how important is formatting of your resume in general but formatting of work experience section is crucial. In a tiny space, you’ve got to present all your successes, to persuade the recruiter that you’re the one for that job and to describe all the things you’ve done in the previous decade and a half. Daunting task, if I may say, but following these guidelines will provide you to stay far from the cardinal mistakes. Bullets – Use bullets. No, not real ones; I’m sure there are better ways to persuade a recruiter that you’re the one. I mean bullets in formatting with your text processor. It’s much easier to read information sorted in snippets of text then to grasp the whole paragraph at once. That’s why you should write 3-6 bullets (never, and I mean NEVER make 7 or more bullets since the focus of attention is completely lost after sixth bullet) filled with accomplishments. One bullet, one accomplishment, of course. Again, because of grasping. Some authors say that it’s allowed for a bullet to slip to the second line. In this particular case I have to disagree. If a recruiter spends 6-15 seconds throwing a first glance over your resume, the second line of the bullet would be a burden for his eyes. Stay on the first line. Also, try to be as concise as you can be without leaving relevant details. Only by formatting bullets by aforementioned rules they fulfill their purpose. Otherwise, they could look cumbersome and you want to avoid that. Consistent formatting – Be sure that elements of your resume are formatted in a consistent way across the whole document. It means headers, indents, columns attributes, fonts (type and size) and text bolding should be done by the same rules in all sections. That applies to the work experience section as well. Make sure that your bullets look the same. Fonts – Use only one or two fonts. One font could be used for the name of the company, position and dates of employment and the other could be used for achievements and responsibilities. Have in mind that designers have the rule about two fonts in the same document. It says that if one of your fonts is serif (with tails), the other one should be serif-sans (without tails). The most used font in resumes is still Times New Roman. Try to avoid it. You’re trying to present yourself as someone exceptional, not generic. Some of the serif fonts which are on a safe side for resume usage are: Georgia, Garamond, Bell MT etc. Also, here are some good serif-sans fonts: Arial, Calibri, Myriad Pro, Tahoma, Helvetica Neue etc. Note that the font size should not be less than 12 and no more than 14. Font size under 12 is hard to read, and you don’t want to make your recruiter uncomfortable. Above 14 is childish and tasteless. Columns – Usage of columns can provide visibility benefits if executed properly. It can highlight the skills you posses and your previous results. Be sure to keep them the same, with same line spacing etc. Typos, grammar and punctuation – This has been pointed out more often than any other advice on resumes ever. It’s such a disqualifying error and it’s still happening in such a significant percentage of resumes, that it’s not bad to repeat it once again: DO NOT make typos, grammatical and punctuation errors! Have a second, third or fourth pair of eyes to proofread your resume if you must but be sure that your resume is free of aforementioned mistakes. They are such an eyesore for recruiters. They show absence of commitment and lack of detail-orientation. It’s just sloppy. Resumes with those types of mistakes go directly to the bin. Tenses – Write in the past tense all about your previous jobs (including achievements). For your current position, responsibilities go in the present tense but finished accomplishments at your present post also go in the past tense. Chief Executive Officer, some small company. There is another form of professional experience that could be very relevant for your future employer, but is omitted from work experience section. It’s your community engagement, volunteer work and leadership related positions you held in different student organizations. Since this is not included into formal work experience, it has a smaller significance but sometimes it is enough to tip the scales to your side. Be sure to list only relevant experiences here, because irrelevant volunteer experience will not do any good for you in the eyes of the recruiter, but will definitely add some extra bulk to your resume. Keywords – In today’s job market it’s very hard to avoid Applicant Tracking Systems. Almost all Fortune 500 and more than 90% of other large companies are using them. Correspondingly, it’s crucial to prepare scannability of your resume, both for humans and machines. That’s easily done by using the same keywords that appear in the job ad. So, be sure to include a good deal of relevant keywords into your resume but don’t get carried away. A resume mindlessly packed with huge amount of keywords is also going to the bin. Properly executed and inserted into right places, keywords help your resume even if it’s not being put into ATS. Action verbs – Another powerful tool for your achievements description. Let’s name just a fraction of them: achieved, built, coached, consolidated, created, decreased, developed, directed, enhanced, ensured, executed, founded, guided, implemented, increased, launched, negotiated, organized, produced, restructured, supervised etc. Be sure to use these valuable words in your achievements description since they are powerful attention grabbers. Never use “I” – You’re not writing a novel but a resume. So, you don’t have to use full sentences. Much better impression will be made without “I”. Active voice – using the active voice, you’re giving impression that you’re in command and that’s exactly what the resume is for. To show how much command of your life and your career you have. Only relevant information – It’s your resume, not your memoires. You don’t have to put in everything you worked on. Explain in details only those positions which are relevant to the recruiter. Narrowing the list of positions this way leads to the most powerful resume targeting. Fresh experience – Be sure to explain in details only positions from the last 10-15 years. Nobody’s interested in your job from quarter of a century ago. Plus, it adds unnecessary weight and length to your resume. So, in order to stay concise, for the jobs from more than 15 years ago, just state the name of the company, position you held and dates of your employment. Another benefit from omitting old jobs from your resume is avoiding age discrimination. If your work experience timeline is going only up to 15 years ago, you’re on a safe side. Read more about this in my other article about resume length. 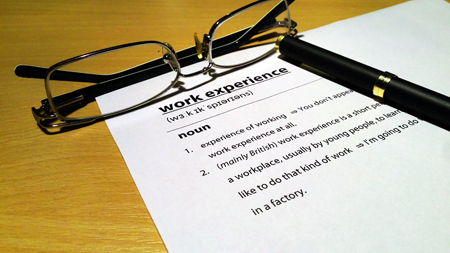 DO NOT LIE in your work experience section – Simple as that. Do not lie. Related topics such as employment gaps, job application out of field, student’s resumes, job hopping, resumes of different formats and multiple positions within the same company are all very important. However, they are too comprehensive for the scope of this article. Be sure that I’m going to try to deliver you my perspective on these in a very short period. Be kind to your work experience resume section. Nurture it. Spend time with it. Never lose it out of focus. It’s the essence of your resume and the part that will decide will you land that interview or not. And always remember one thing: achievements rule the resume. Without them, it would be just a piece of paper with some descriptive fluff words. Back up those words with achievements and show that you’re a valuable option for a recruiter or hiring manager. It’s almost unbelievable how many people still omit doing that. For you, having read this article, it just means there’s more space for your resume to shine. Good luck with your job search and go get them!!! Great article! I can see my mistakes now…What a pity! Thanks you Vladimir. I’m going to shape my resume now. You’re welcome, Moustapha. Please, feel free to contact me if you need any help.